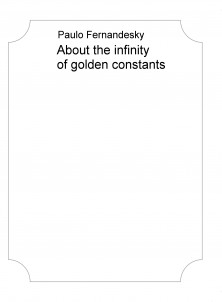 The first golden constant, has been applied in diverse situations in art, architecture and music, and although some have claimed that it represents a basic aesthetic proportion, others have argued that it is only one of a large number of such ratios. We also speculate on the neurophysiological basis behind the sense that the golden mean is a pleasant proportion. About the arithmetic of presented element, applying and find paradoxical properties in immovable state total or partial in constant paradoxical calls. Ie, with intrinsic effects where the resulting term is established. The principle of its results is innate and related to its proportional operation. Here, we present their properties and apply them to a simple square with identical proportions to its base. This is done not only by the reason that exposes the paradoxes, but we are certain that there is much to talk about this principle. Much beyond the divided measure on the extreme reason, but much more beyond the inverse value of these ordered segments. For example, Where we divided pi by 2,3416277... About Trigonometric, in summary, the canonical section deﬁned as the intersection of the regular circular conical surface and the plane which passes through the two halves of the cone, it is a curve paradoxically deﬁned in Cartesian plane.